State Budget Director Robert Mujica and New York City First Deputy Mayor Dean Fuleihan spoke at a CBC event on Wednesday, January 24 to discuss the implications of the recently-passed federal tax reform on the state and city. Mujica and Fuleihan discussed how the state and city are responding, with a great deal of budget fallout to come. Ben and Maria were there and provide an intro and brief discussion of the speeches, and this episode then brings you the full remarks from Mujica and Fuleihan, with enlightening audience Q&A after each. You can also catch the video of the entire event, which included two-panel discussions, at the CBC website. The City Council held its final hearing on Mayor Bill de Blasio’s $84.86 billion executive budget proposal on Thursday, with Council members raising issues that have persisted throughout budget season and expressing concerns about the federal budget proposal released this week by the Trump administration. 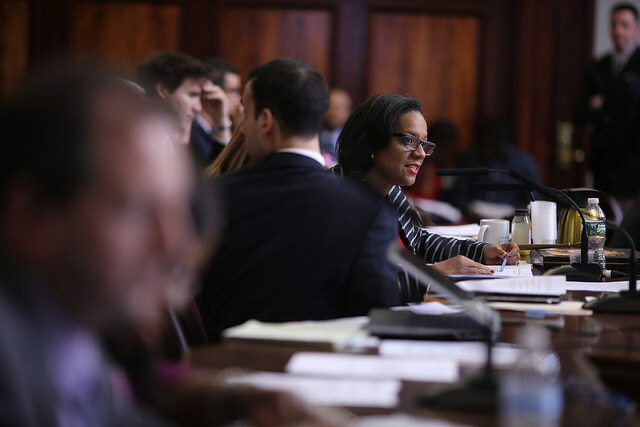 “The city adopts the Fiscal 2018 budget at a time of great uncertainty about the future of critical programs and services that help many of our most vulnerable populations,” said Council Member Julissa Ferreras-Copeland, chair of the Council’s finance committee, in a prelude to a deal that must be reached between the Council and de Blasio by the July 1 start to the new city fiscal year. Many are expecting a deal much sooner than that deadline, though. Ferreras-Copeland called the White House’s budget proposal “devastating,” pointing out that it outlines cuts to food stamps, Medicaid, housing programs, and the earned income and child tax credits. She worried that many city agencies hadn’t developed contingencies to cope with those potential cuts. Although Ferreras-Copeland commended the de Blasio administration for funding key initiatives -- air conditioning in public school classrooms, immigrant support services, planning for borough-based jails in the effort to close the Rikers Island complex -- and reducing excess capital appropriations, she criticized the lack of funding for universal school lunch, senior services, youth jobs, and the Emergency Food Assistance Program. The budget, “as it currently stands, does not appropriately reflect the vision of both the Council and the Mayor,” she said. Ferreras-Copeland said the administration had failed on a few fronts, particularly in reforming the capital appropriation process and providing transparency. She cited, for instance, the mayor’s announcement of a partial hiring freeze for administrative and managerial positions. “Because the Administration did not issue guidance on this plan until well into the budget hearings, agencies were unable to provide us any detail about how it would affect them,” she said. She also called for increasing city reserves, from the current 10.7 percent of adjusted spending to somewhere between 12 and 18 percent. Reform of the capital projects management system seemed of particular importance at the hearing and Ferreras-Copeland wondered why projects experienced consistent delays and cost overruns. Council Member Brad Lander later released an issue brief at the hearing, prepared in concert with other members, that showed 44 percent of capital projects that cost more than $25 million were severely late and 42 percent of projects were severely over budget. On average, the brief noted, projects were $30 million over-budget and 700 days late. “This is not the fault of the de Blasio administration but we have a shared responsibility to do more to fix it,” Lander said. Fuleihan agreed with that sentiment, while insisting the administration was making incremental improvements. “We need to work together...we need to be careful, we need to be thoughtful about this,” he said. The city will pass both a new fiscal year operational spending plan and a revised 10-year capital spending plan. The capital plan is revised every other year. Fuleihan also promised to provide more detail about lump sum appropriations for a number of city agencies, an issue that Ferreras-Copeland said prevents the Council from full oversight. He also explained the implementation of the administration’s partial hiring freeze, which includes a variety of caveats, as the mayor had indicated it would. Council Member Jimmy Van Bramer, chair of the Committee on Cultural Affairs, Libraries, and International Intergroup Relations, pushed the administration on a $150 million capital need for city libraries and for $40 million in increased allocations for cultural institutions facing the threat of federal funding cuts. Fuleihan stressed that the city has made significant investments in libraries, including capital allocations and operational funds for six-day service. “There’s always significant needs there, I’m not minimizing that...It’s another area where I think we all need to see some improvements,” he said of library capital projects. Cultural institutions, he said, were “part of the conversation we’re having,” and vowed that the administration will fight back against any proposed cuts. Both Council Member Ydanis Rodriguez and Council Member Laurie Cumbo reiterated a request for funding “Fair Fares” to give discounted Metrocards to low-income New Yorkers. It is one of the few budget requests that the mayor has absolutely refused to fund, insisting that the state or state-controlled MTA should provide the funding. Fuleihan repeated that rationale at the hearing. 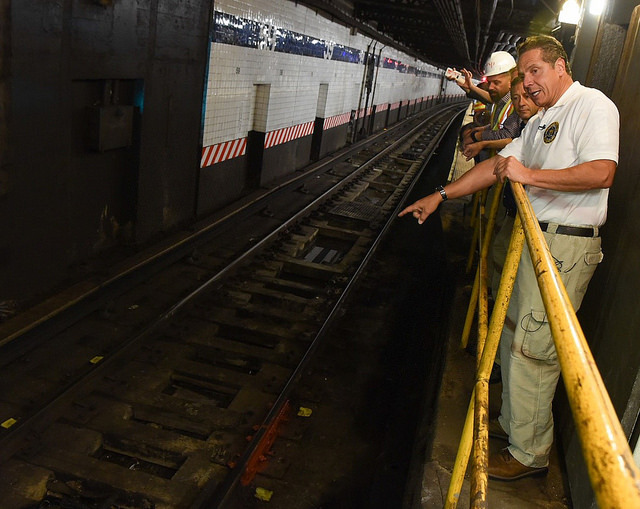 “The mayor is more than sympathetic towards this but he feels that the appropriate place to fund it is the MTA,” he said. And although he said that the city’s economic outlook remains strong -- with a projected surplus in fiscal 2017 that will “equal or exceed” the previous year’s $4 billion surplus -- he said revenue and job growth were slowing. “I remain concerned that we are not adequately prepared for a potentially rocky road,” he said. Stringer listed a few of his own priorities for the budget, calling for reductions in the cost of citizenship applications to relieve the financial burden on 670,000 eligible immigrants. He also reiterated the need to fund human services nonprofits, releasing an accompanying analysis of the industry, and finally insisted on procurement reform at the Department of Education. State Comptroller Thomas DiNapoli also released an analysis of the federal budget proposal on Thursday, calling for increased reserves to weather economic uncertainty and the potential rollback of the Affordable Care Act. “The President's proposed budget would make steep reductions in programs upon which city residents rely and poses a major risk to future city budgets,” DiNapoli said in a statement. With Thursday’s hearing, the public facing part of the budget process comes to an end, save for the rallies and press conferences that may occur to lobby for additional funding for specific causes. The City Council and the mayor will now move to closed-door negotiations to hammer out the final tweaks to the spending plan. Last year, the final budget deal reduced spending by about $100 million from the proposed executive budget. Council Speaker Melissa Mark-Viverito and Mayor de Blasio ceremoniously shook hands on that budget agreement on June 8, the earliest agreement in 15 years. The next budget is due by July 1, the start of the 2018 fiscal year. 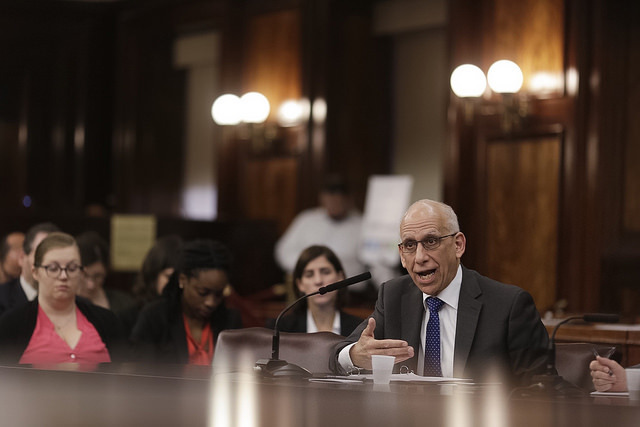 The City Council held its first hearing on Mayor Bill de Blasio’s $84.86 billion executive budget for fiscal year 2018 on Thursday, and Council members gave the mayor a mixed review for his updated spending plan. They praised de Blasio for increasing funding for a number of recommendations made by the Council and for taking steps to control the capital budget. But, Council members expressed concern that crucial priorities remained unfunded, or underfunded, even as the latest budget plan increased projected spending by $700 million over the preliminary budget released in February. The hearing kicks off the final weeks of public Council hearings, private negotiations, and lobbying by interest groups and advocates, with the mayor and Council due to agree on an adopted 2018 budget by July 1, the first day of the new fiscal year. At Thursday’s hearing, City Council Speaker Melissa Mark-Viverito commended the administration for increasing funding for the Administration of Children Services, for including funds for borough-based jails and an adolescent facility -- measures that are key to the closure of the Rikers Island jail complex -- and for reducing excess capital appropriations by $3.2 billion. The speaker noted that it was a “bittersweet day” for her, since this is the last executive budget process she will participate in (she is term-limited out of office at the end of the year). 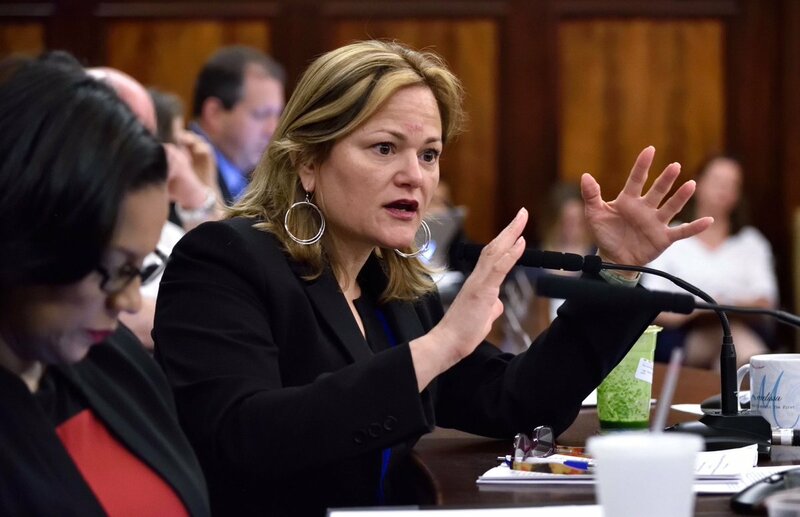 Mark-Viverito said she is disappointed that the budget did not expand the Summer Youth Employment Program, a six-week paid jobs program for youth 14-24 years old, from the current baselined 65,000 slots to 80,000 slots for fiscal year 2018. She is “dismayed” that the budget did not eliminate all school lunch fees, which would have done away with the stigma associated with free lunches available to low-income students, she said. The speaker also said that though the budget deals with excess capital appropriations, it does not include a comprehensive plan to reform the capital planning process, which is home to faulty projections and consistently over budget and late building projects. “My colleagues and I remain worried that this budget continues the practice of committing funds that significantly exceed the city’s ability to actually execute projects,” she said. Mark-Viverito, Council Member Julissa Ferreras-Copeland, who chairs the finance committee and is a key player in budget negotiations, and other Council members also pushed the administration to increase the city’s reserve funds to prepare for the threat of funding cuts under the Trump Administration and the Republican-led Congress. 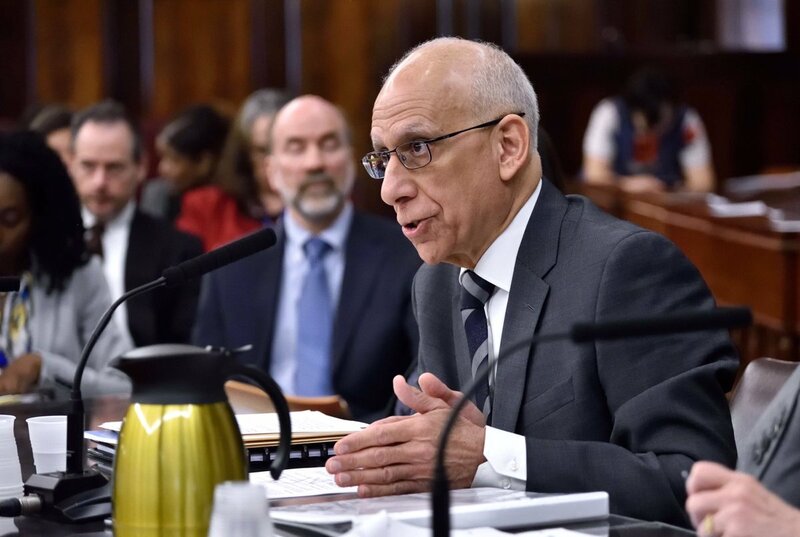 Ferreras-Copeland similarly expressed approval of several of the administration’s funding commitments, including for air conditioning in school classrooms, repairs at NYCHA buildings, and construction and renovation of animal care centers. She also applauded the mayor’s “3-K” initiative, to expand pre-kindergarten to all 3-year-olds in the city. But, she maintained that the budget “clearly falls short in a number of critical areas,” and fails to fund several Council priorities. 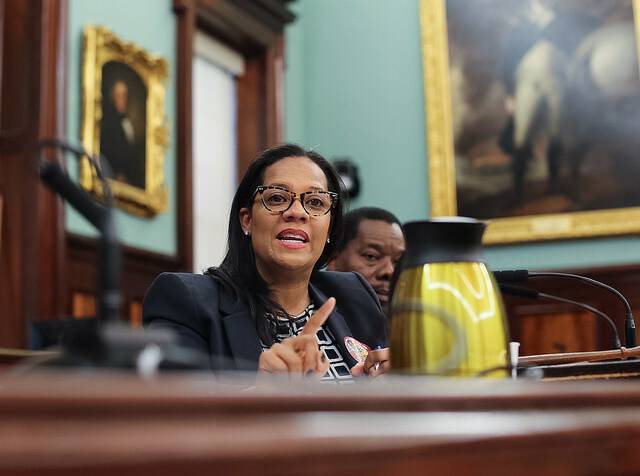 “This cannot simply be explained as a matter of budgetary caution,” she said, citing the city’s pattern of budget growth and the $700 million in new funding from de Blasio’s preliminary budget. 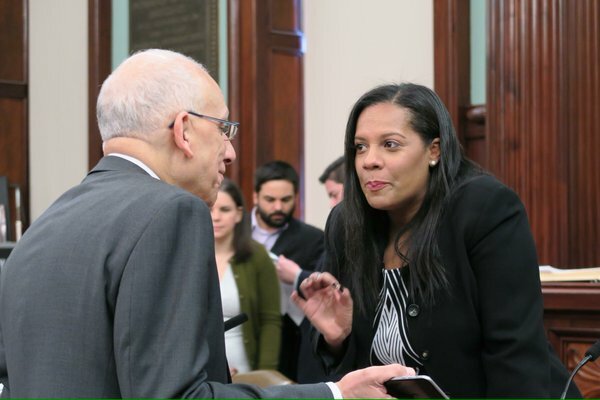 Ferreras-Copeland (pictured, left) criticized the lack of funding for senior services and the SYEP program, the failure to fund the Emergency Food Assistance Program (EFAP), and the $6.25 billion increase in the ten-year capital budget without accompanying efficiency measures. She said the mayor’s executive budget does not adequately account for the dangers from Washington D.C. and that spending was growing faster than revenues in a time when the city is facing signs of a predicted economic slowdown. “The executive budget does not go far enough to truly display a commitment to fiscal prudence pledged by the administration,” she said. Fuleihan stressed, as he has in the past, that the budget maintains historic levels of reserve funds - with $1 billion annually in the general reserve, $4 billion in the Retiree Health Benefits Trust Fund, and $250 million each year for four years in the Capital Stabilization Reserve. Fuleihan’s assurances didn’t seem to set the speaker’s mind at ease. 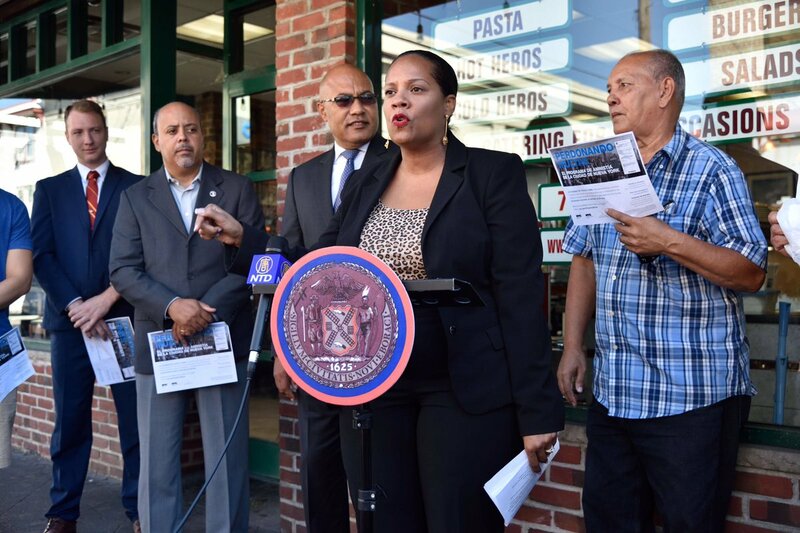 Mark-Viverito expressed worry that the city’s spending growth could eventually be a problem. “While in the short term, what we’re seeing seems to be OK, in the long term there are concerns that this could be unsustainable,” she said. The city budget has increased dramatically under de Blasio and Mark-Viverito -- given the mayor’s executive budget, it would be up $12.2 billion since the last modification under Mayor Bloomberg in November 2013. Fuleihan, however, sought to allay those fears, pointing out that the city adjusts and reevaluates the budget continually through the year and would be able to respond as needed. “Your point that we constantly need to be cautious and concerned and find additional ways of savings and maintaining our high levels of reserves, we should be working with you to that goal,” he said. Mark-Viverito also raised the question of whether the city should return to instituting a Program to Eliminate the Gap or PEG, a Bloomberg-era mechanism that set targeted goals for reducing spending at city agencies. De Blasio did away with the PEG, instead opting for a voluntary Citywide Savings Program that he insists is more effective. Fuleihan echoed that point at the hearing, insisting that this administration’s process had been more collaborative. “We have achieved more savings that way,” he said. The speaker also asked for estimates, that the budget currently doesn’t include, of how the recently announced plan to close Rikers Island jails over ten years would affect the city budget. Fuleihan had few answers, pointing out that the plan -- which there is currently almost no details for -- affects multiple agencies and also relies on the Raise the Age legislation just passed by the state that will be phased in over the next few years and will transfer 16- and 17-year-olds off the island. Ferreras-Copeland later brought up the SYEP program, stressing that the administration’s commitment to youth jobs seemed lacking. “Essentially this agency is saying “no” to far more young people than we are saying “yes” to,” she said. Fuleihan insisted that the city has baselined 65,000 slots for the program, showing that the administration is indeed committed to SYEP. He also noted that a joint youth jobs task force created by the Council and the administration to study the issue only recently released its recommendations and that those would be incorporated before the adopted budget. “I had no doubt that this was going to be another priority that we’re going to be working together on adoption now that we have the task force recommendations,” Fuleihan said. The hearing touched on a number of other budget items, small and large, and many related to individual Council members’ purviews as chairs of Council committees. 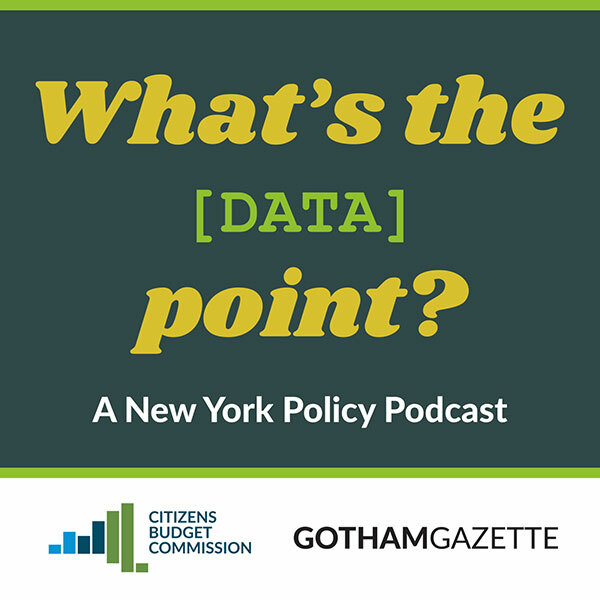 For instance, Council Member Jimmy Van Bramer, chair of the cultural affairs committee, brought up funding for the arts; transportation committee chair Council Member Ydanis Rodriguez questioned the administration’s refusal to back discounted Metrocards for low-income New Yorkers; and Council Member Ben Kallos, chair of governmental operations, pushed for budgeting to be linked with agency performance. In his typical refrain, Fuleihan repeatedly said OMB would work with the Council members on their individual concerns. One of the larger issues addressed at the budget hearing was the city’s capital plan -- not the level of funding, but rather the process of allocation. Council members said the city has often allocated excessive funds for projects that are often delayed and that no plans exists to account for cost overruns. Council Member Brad Lander pushed Fuleihan to go further, insisting that there’s “a need for systemic reform” of capital project management. “Will you form with the Council a task force to look systemically at capital projects management reform?” Lander asked. Fuleihan seemed open to the idea of resolving issues before the adopted budget but did not commit directly to the idea of a task force. “We should discuss what’s the best way to do that,” he said. Another prominent issue discussed Thursday was funding for the Emergency Food Assistance Program. The entire Council signed on to a letter to the mayor released Thursday, calling on him to include $22 million in baseline funding for the program, up from $8 million currently outlined. “The epidemic of hunger in our city disproportionately affects women, children, seniors, and communities of color and it’s critical that we can guarantee that no New Yorker is turned away from a pantry or soup kitchen,” the letter reads. For the next few weeks, the Council will hold individual hearings to examine agency budgets and then issue an official response to the administration. The two sides will then move to closed-door negotiations before coming to a final agreement on an adopted budget for the next fiscal year that begins July 1. Roughly $7 billion in federal funding to the city is threatened by the proposed policies of the Trump administration and the Republican Congress in Washington D.C., and those threats have cast a pall over the city’s budgeting. 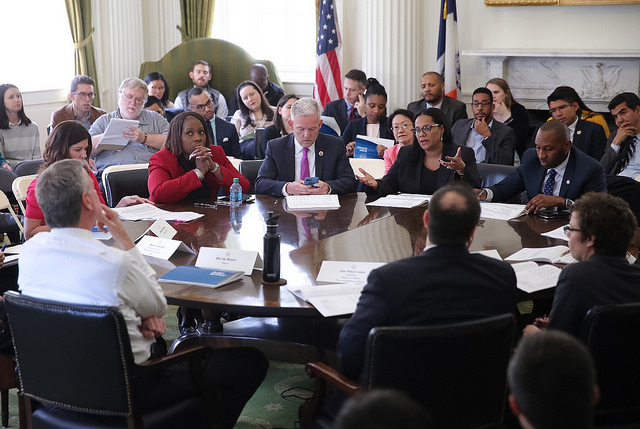 The de Blasio administration and the City Council find themselves having to decide agency allocations and long-term spending with one hand tied behind their backs, while also facing a local economic slowdown that has diminished tax revenues and slowed job growth. “It is clear that Republican budget priorities will harm our seniors, our children, our first responders, and those seeking quality public housing, job opportunities and affordable medical care,” said City Council Speaker Melissa Mark-Viverito, a Democrat, in her opening remarks at Thursday’s hearing. And, as if the federal government were adding salt to the wound, she pointed out that the city is being forced to spend millions in providing security at Trump Tower, with reimbursement uncertain. Mark-Viverito speculated that the federal budget, in which Trump has promised to prioritize defense spending over discretionary programs, could include cuts to Medicaid, education funding, and to the Supplemental Nutrition Assistance Program (SNAP, or food stamps), among other programs that serve the city’s most vulnerable. Trump’s executive order that calls for cutting federal funding to so-called sanctuary cities could, if enforced, hit New York hard, as could a potential repeal of the Affordable Care Act, which both Trump and Republicans in Congress have promised. The de Blasio administration has taken stock of the situation -- coupled with some proposed cuts in state funding outlined by Gov. 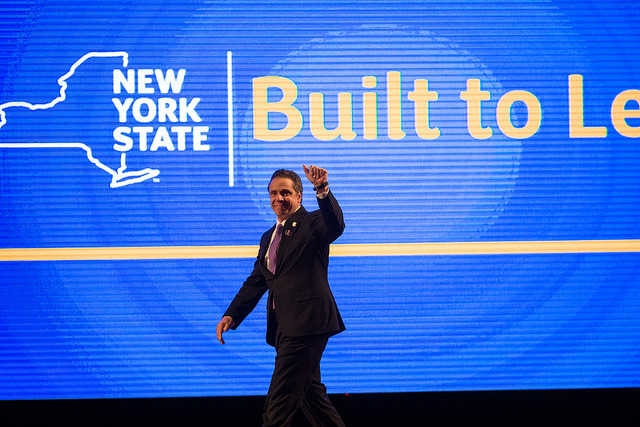 Andrew Cuomo in his own January budget proposal -- and has been “cautious” in its budgeting, said Dean Fuleihan, director of the Office of Management and Budget, in his testimony on Thursday. Appearing before the Council during his annual budget testimony, Fuleihan sought to assure Council members that the administration is prepared for any blowback from federal cuts and is also actively working to prevent those cuts. “We continue to budget strategically, and we remain focused on critical areas including public safety, education and social services,” he said. Over the course of three hours, Fuleihan took questions from Council members on the city’s savings, reserves, capital appropriations, and on specific policies and programs. Many inquiries related in some way to the fear of federal policies and what budget cuts might mean for the city. But Fuleihan’s testimony seemed light on details, particularly with regards to the mayor’s homelessness plan announced the day before. He explained to the Council that the administration had few cost estimates for the new approach to homelessness -- which focuses on creating new shelters while shutting down the use of cluster sites and hotels -- because much of the plan is predicated on the “reallocation of existing resources” and will require, as with each budget cycle, adjustments and enhancements. Fuleihan argued that the city has adequate savings and rainy day funds. The city found $1 billion in savings in the November adjustment to the fiscal year 2017 budget, identified about $1.1 billion in the fiscal year 2018 preliminary budget, and the mayor has promised his administration will find another $500 million by the time the executive budget is released early this spring. Another $1.3 billion will come from healthcare savings in fiscal year 2018, the administration has guaranteed. After Thursday’s initial hearing on the overall spending plan in front of the Council finance committee and whichever Council members chose to attend, the Council will now hold weeks of hearings one or two committees at a time, calling before it the relevant city agencies -- the Council health committee will hear from the Department of Health, for example. Friday will see the higher education committee’s preliminary budget hearing. Besides projected expenditure in the next fiscal year, Thursday’s hearing also focused on the city’s $89.6 billion preliminary ten-year capital strategy. This is the city’s plan for infrastructure spending that is separate from its annual operating budget. A new ten-year capital plan is due every other year. 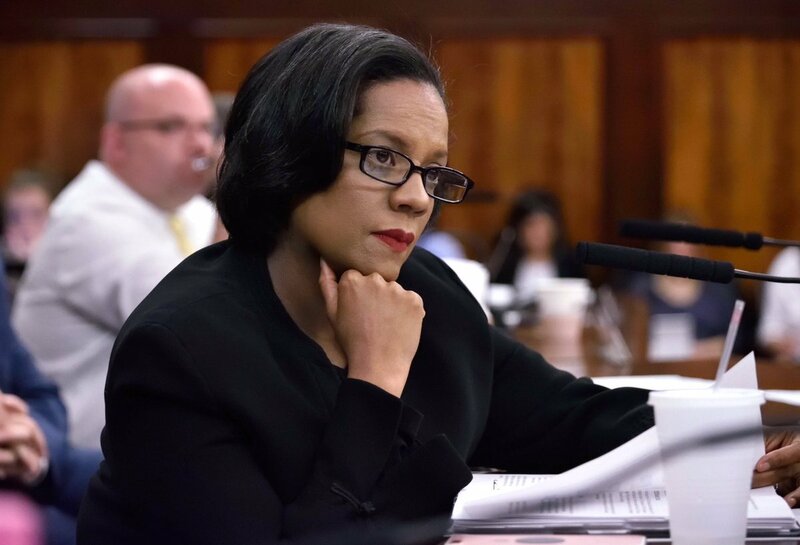 Council Member Ferreras-Copeland expressed concern that capital appropriations made in excess for the current fiscal year diminish the Council’s oversight authority. “Because of the excess appropriations, the administration can add capital projects during the Fiscal Year without Council input or approval,” she said, promising to make this a central issue in budget discussions. Other Council members touched on a broad range of budget items, specifically issues that related to committees which they chair or are members of. Council Member Helen Rosenthal, chair of the contracts committee, raised concerns that the city must to do more to fund nonprofit human services providers contracted by the city. Fuleihan, in response, pointed to wage raises provided by the city in the past few years, as well as the 6.12 percent salary increase over three years proposed in the new preliminary budget for fiscal year 2018. As chair of the health committee, Council Member Corey Johnson naturally inquired about how the city’s struggling municipal hospital system, New York City Health + Hospitals, could remain fiscally sound without support from the state, particularly with the Affordable Care Act under attack at the national level. “We’re very comfortable that the current fiscal year, Health and Hospitals is within their budget,” Fuleihan said, noting that the system had actually seen revenue improvements. 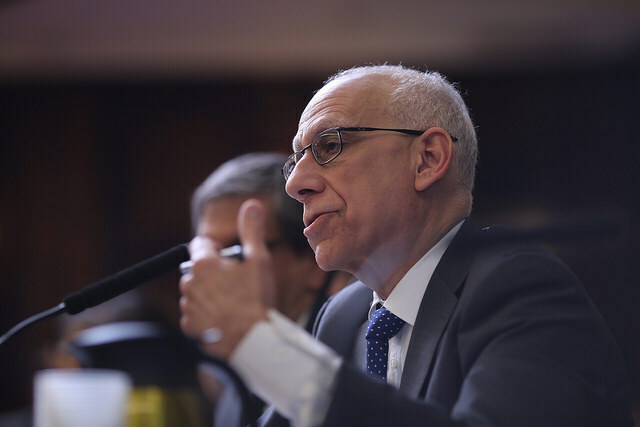 Like the city’s housing authority, NYCHA, the public hospital system has seen an overhaul of its financial planning under de Blasio, but is still in dire straits, and may be in worse shape based on decisions out of Washington, D.C.
Fuleihan’s testimony was followed by that of representatives from the Department of Finance, Comptroller Scott Stringer, and the city’s Independent Budget Office, as each gave their analysis of the city’s fiscal situation and next year’s budget needs. State Comptroller Thomas DiNapoli also released his report on the city’s fiscal health on Thursday, noting the “external threats” that pose a risk to the city’s budget, including potential federal and state funding cuts. Stringer reiterated what he said two weeks ago when he first presented his analysis of de Blasio’s preliminary budget, calling on the mayor to add another $1.7 billion to reserves to increase the city’s budget cushion from the current 10 percent to the optimal range between 12 and 18 percent. De Blasio has repeatedly said he is very comfortable with the city’s savings and does plan to keep adding, but he has dismissed Stringer’s calls for a fluffier budget cushion several years running. The next city fiscal year starts July 1.